In terms of weather, this weekend gave us the first real glimpse of Fall. And while I’m still not ready for those Pumpkin Spice Lattes (that happens around October for me), I have started to move my cardigans front and center, unwrap Fall decor, and debut darker lipsticks. Love “your” Fall colors and the candy! Thanks, Sue! You know I can’t live without my candy! Great pictures! I’m super excited for Halloween and all the candy! Have a wonderful week. Right? I thought I was getting prematurely excited for Halloween, so I’m glad I’m not the only one looking forward to it. I’ll feel better about indulging in pumpkins and Pumpkin Spice Lattes in a couple of days when it is officially October. Have a great week, Samantha! In love with that lip color! I am obsessed with any candy for halloween! Thanks, Chelsea! That NARS color is one of my faves, too. Thanks for visiting! 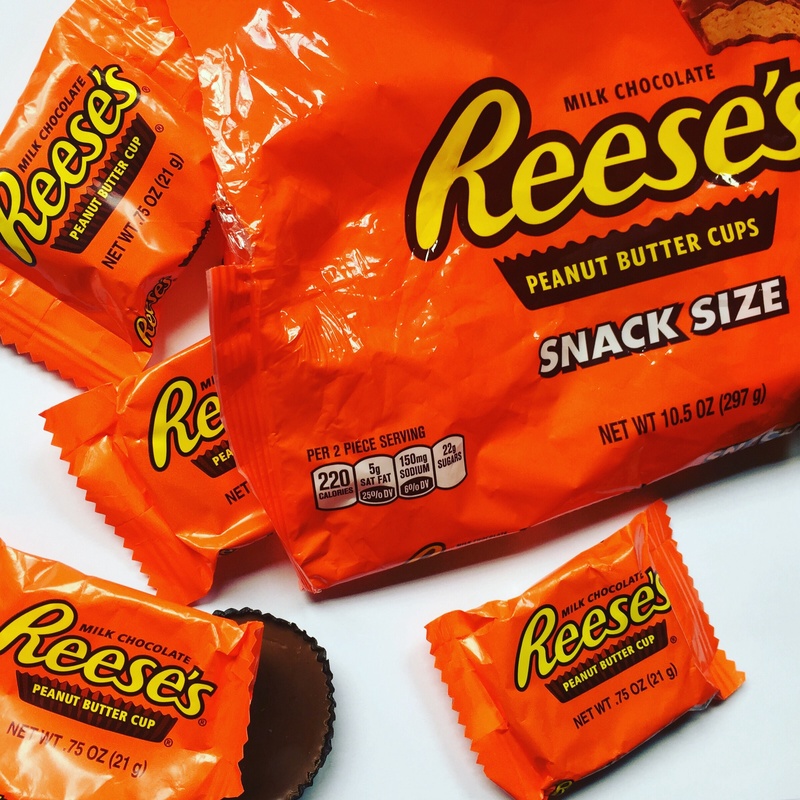 Man, Reese’s are always a favorite of mine! That skull is too fun, and I love your nail color. Thanks, Amy! I love Reese’s and I thought the skull was perfect for holding Candy Corn. Thanks for visiting! Love your fall faves, snack sized candies are the best and yet so dangerous. Tell me about it, Rachel! I don’t even want to tell you how fast that bag was finished. Thanks for visiting! I love that nail varnish shade!! Very autumnal!! Isn’t it? I was so excited when I got to wear this shade again. Thanks for visiting, Becky! Oh girl, this post has me dreaming of fall!!! Love the nail color and lipstick color! Not to mention the candyyyyy! Thanks, Alina! My favorite thing about fall is that I get to break out the darker hues. But I never need an excuse to bring out the candy. Thanks so much for visiting! Thanks, Kathrine! 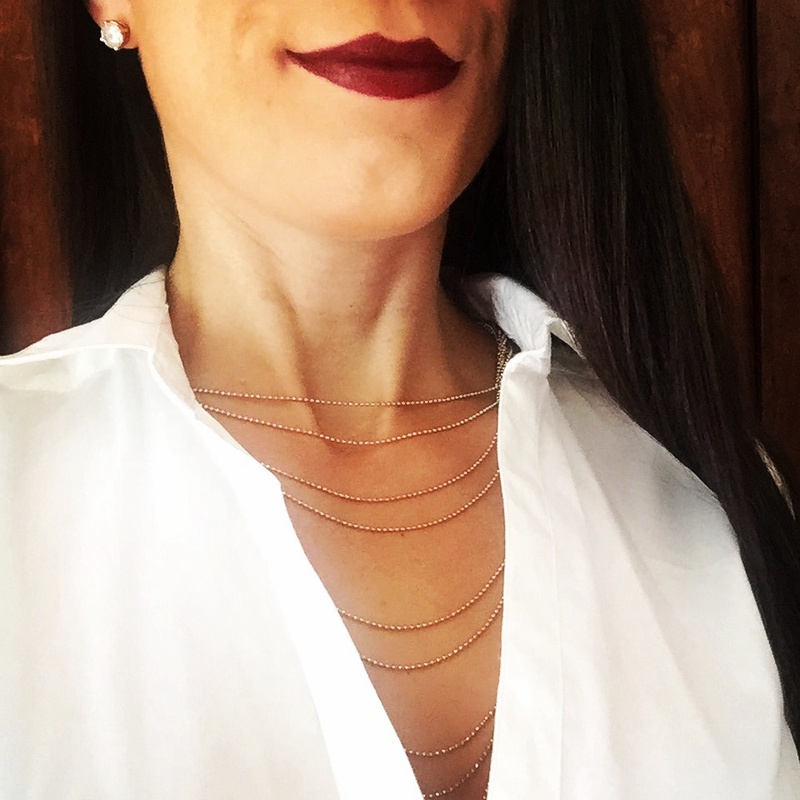 I love layered necklaces, so this was an instant fave when I spotted it at H&M. Thanks for visiting! I was a little reluctant about Fall, but now I am so excited about it! I can’t wait to see the leaves change color!! This is a great Fall roundup! Thanks, Rach. I admit that it’s taken me a while to get excited about fall. I love summer, so layering up is not ideal for me. But I’ve seen a lot of cute cardigans and riding boots that have made the transition easier on me. Thanks for visiting! Sounds like you had a lovely weekend, Viviene. Thanks so much for visiting! I’m right there with you on the weather, Carmen. I love the hot days of summer, but the weather on the East Coast has been rather indecisive. Today, it’s hot and muggy! Vanessa!! 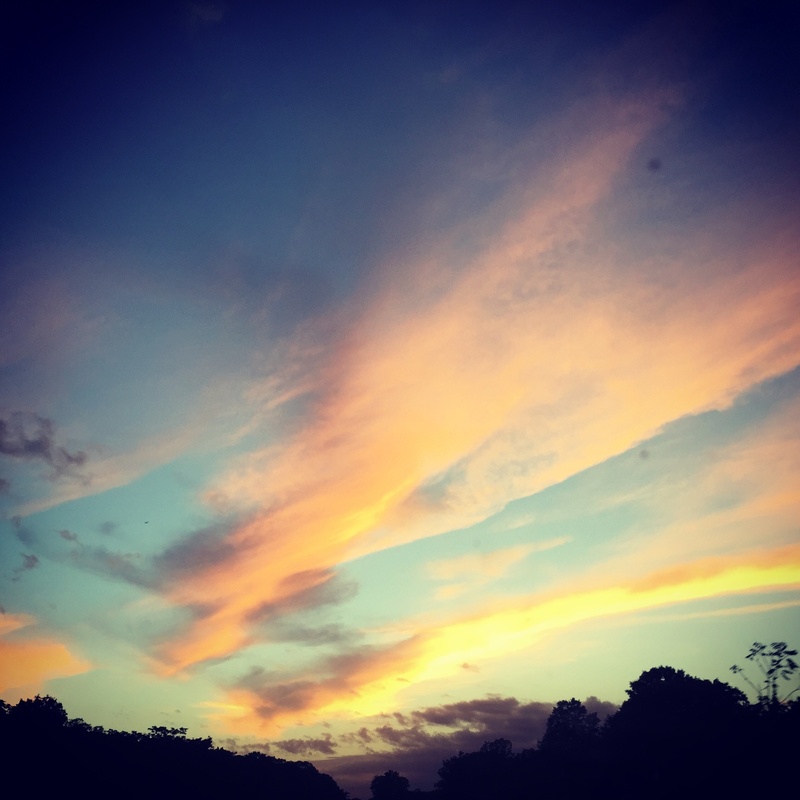 Love your blog and especially this post. Your darker lips are looking superb! 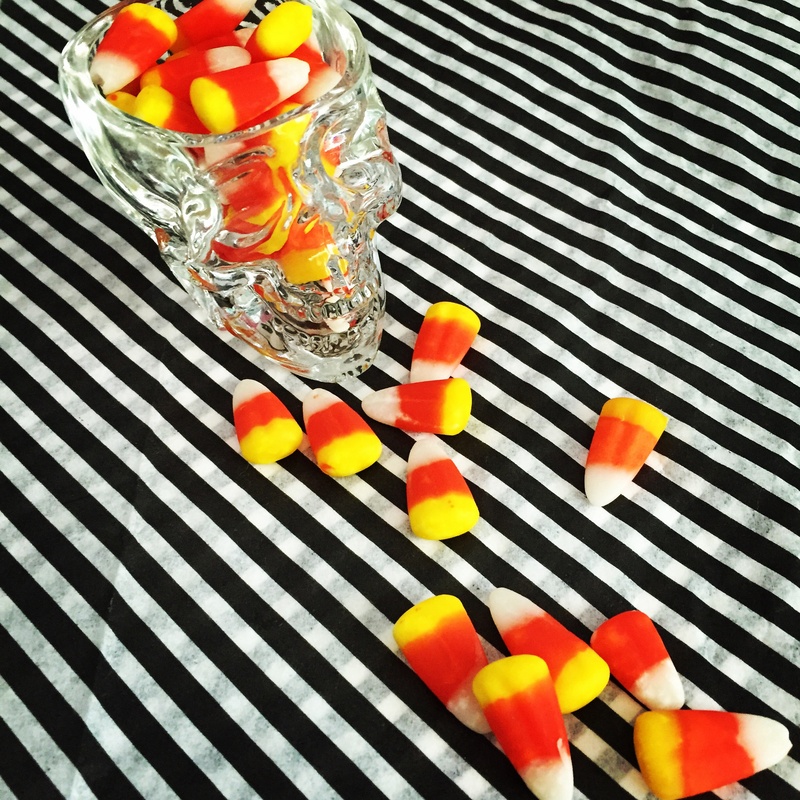 I also love that candy corns in the skull shaped shot glass. I have a very similar one and was wondering what I could do with it so thank you for the inspo 😉 I hope your Monday is treating you well! Thanks, Kelly! I love your blog, too. Glad I could give you some inspiration. Have a great week and thanks for visiting! Love that nail polish color! And the Reese’s of course, yummy! Thanks, Jamie! 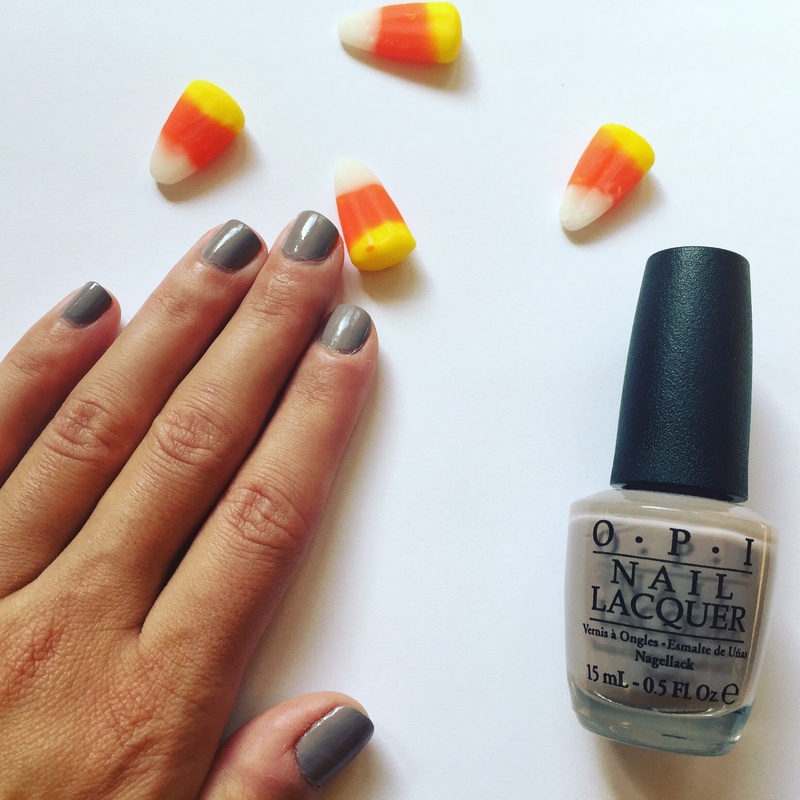 That nail polish shade goes with everything and is perfect for fall. Reese’s peanut butter cups are my absolute FAVORITE! Mine too, Jillian. They’re so good…and very addicting! Thanks for visiting! Darker hues, yes! Loving your nail polish and necklace! Thank you, May! I love darker hues once the temps drop. The necklace is from H&M and a definite fave. Thanks for visiting! that is the perfect shade of gray nail polish. I like the darker hues that come out in fall too! Thanks! Taupe-less Beach is one of my favorite colors. Candy Corn is the best! Thanks for visiting Living in Steil and enjoy the weekend.